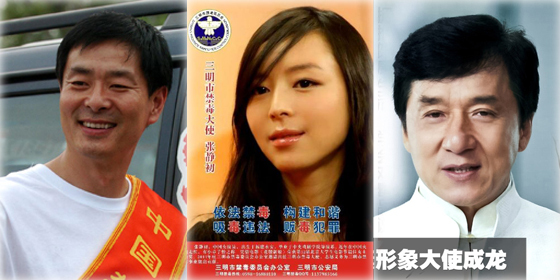 Singer and actor Jaycee Chan, son of well-known actor Jackie Chan, together with popular Taiwanese actor Kai Ko, were caught by Beijing police for using and possessing drugs on August 18, bringing shame to the entertainment industry, which has received much negative publicity due to the numerous celebrity drug scandals exposed this year. Many popular actors, singers and scriptwriters have recently been caught using drugs, including actor Gao Hu, actor Zhang Mo, director Zhang Yuan, singer Li Daimo and scriptwriter Ning Caishen. The number of addicts in the industry is hard to believe. However, many stars in the industry, such as Jackie Chan, have given us good examples of drug use prevention. These actors participate in various activities and advertisements, warning people to stay away from drugs in their songs and films. Famous actress Zhang Jingchu was invited to serve as the "Anti-Drugs Ambassador" of Sanming City, Fujian Province in 2011. She was born and raised in the city and is very popular in her hometown. In 2008, she starred as a confused, sad and desperate woman who indulged in drugs in the movie "Protegé." Her great performance in the film showed the extent of drugs' danger to society, shocking many people. The stars in this story have promoted drug use prevention, bringing positive energy to an industry that has been overshadowed by many stars' drug scandals.